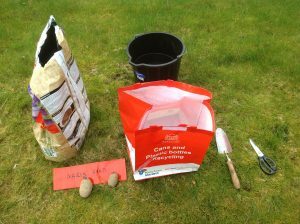 Potatoes can easily be grown in bags or containers and this is an ideal way to grow if you have limited space or no garden. 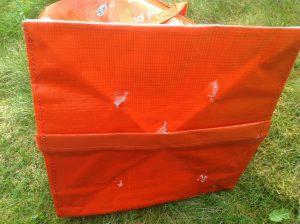 The bags or containers should be placed in a bright, sunny position. Potatoes can be grown in any bag or container if it is at least 12 inches wide and deep and has drainage holes. 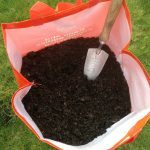 Plant 2 or 3 tubers in a large bag or container (30 litres +) but only one if you are using a smaller bag or container. 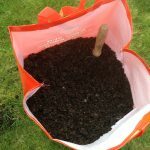 Make a few holes near the bottom of the bag to help drainage. If using a container make sure the holes in the bottom are clear of the ground to let excess water out. The recommended planting time is March up until late-May. If a frost is expected you could put some scrunched up or shredded newspaper on top to protect the new shoots. You could plant earlier in a greenhouse but it must be frost free. 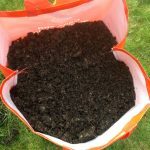 Put about 5-6 inches of multi-purpose compost (mix it with soil to save a little money) into a bag or container and place the tubers, with the shoots pointing upwards, into the top of the compost and then cover them with 4-5 inches more compost. Bed them in with a good soaking of water and remember to label them so you know which variety is in the bag. When shoots start to appear cover them with more compost, leaving the tips showing. As they continue to grow keep adding more compost until it’s near the top of the bag. 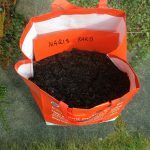 Another easier option is to simply fill the bag with compost and then push the tubers, rose-end upward, 5 inches down into the compost. Water and wait for them to grow! 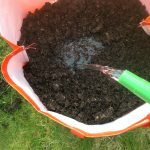 You should water frequently, particularly in dry weather – the compost should be damp but not sodden. Occasional heavy watering is better than little and often. When the plants are flowering the tubers are starting to form. 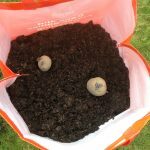 You can check they are ready either by scraping away some of the compost or by pushing you hand into the compost to feel for the tubers. If they are ready you can either pull out what you need and then re-cover the rest for later or empty out the whole bag. The potatoes will get bigger the longer they are left to grow! Tubers exposed to sunlight will turn green. Don’t eat green potatoes – they contain a toxic alkaloid, which can cause vomiting and stomach upsets. The leaves and tomato like fruits are also poisonous.